In the mid-12th century, geographer and traveler Muhammad al-Idrisi completed his life’s work—the most accurate map of the world yet produced, along with its accompanying commentaries. In this cartographic gem, he records that in the Sicilian city of Catania, locals venerated an ancient basalt elephant called “u Liotru” said to possess magic powers and he ability to predict the eruptions of nearby Mount Etna. 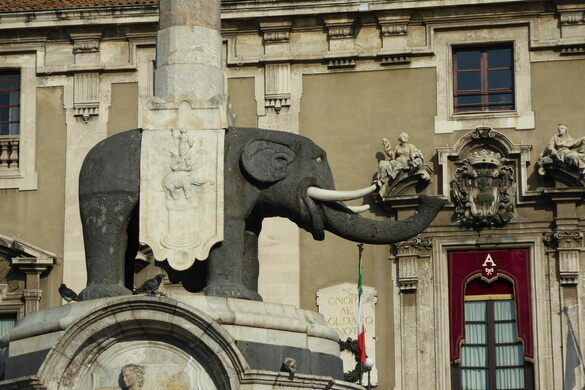 Today, the enigmatic pachyderm mentioned by the geographer sits atop an 18th-century fountain in the middle of a piazza. The fountain was constructed in the 1730s by Sicilian architect Giovanni Battista Vaccarini, who appropriated the city’s by-then legendary elephant as its centerpiece. Vaccarini draped a marble saddle cloth over the elephant that bears the coat of arms of St. Agatha, Catania’s patroness. For the icing on his totemic cake, Vaccarini plopped an Egyptian obelisk of equally mysterious origin on the elephant’s back. The facts surrounding the construction of the fountain are known, but pretty much everything else regarding u Liotru the elephant and the Egyptian obelisk he carries is not. Though the best guess at dating the elephant is during Roman times, and a local provenance makes sense given the statue’s volcanic rock construction, some have observed the statue’s design doesn’t appear to be Roman. The mysterious elephant was a symbol of the city long before it was officially put on the map. 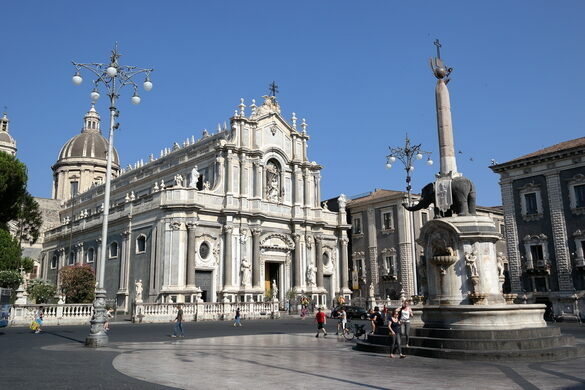 During the 9th through 11th-century Muslim rule of Sicily, Catania was known in Arabic as Madinat al-fīl, “The City of the Elephant,” hinting at the existence of u Liotru prior to al-Idrisi’s 12th-century description. A folktale regarding the elephant is set even earlier, in eighth-century Byzantine Catania. It describes a Catanese nobleman named Heliodorus (from whom the name Liotru might have derived), who turned to necromancy after losing a bid to become bishop of Catania to a certain Leo (later sainted as St. Leo Thaumaturgus, or “The Wonderworker”). In a plot that resembles the New Testament story of Simon Magus, Heliodorus dazzles the townsfolk with his mastery of the dark arts to outshine his pious rival. The sorcerer builds the elephant and brings it to life, at one point even riding it to Constantinople. As delighted as the simple townsfolk are by Heliodorus’ antics, Bishop Leo is enraged, and has the last laugh by ordering Heliodorus burned alive in the nearby thermal baths. Presumably the townsfolk are equally entertained by this outcome. 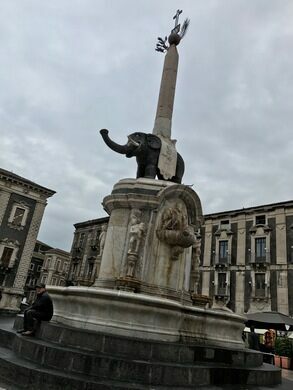 Against Leo’s wishes, however, the people of Catania insist the magical elephant be kept intact inside the city walls. In 1239, Catania rebelled successfully against its ruling bishop-count to become a royal city, free from previous feudal obligations (better to be ruled by a king in distant Palermo than a bishop next door). It was at this time the Catanese chose u Liotru as the city’s symbol, replacing St. George. 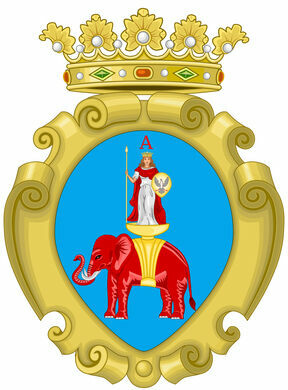 The elephant can now be seen on the coat of arms of the city of Catania, the province of Catania, and the University of Catania, as well as on the insignia of many local organizations and sports clubs. A statue of a mischievous raccoon towers over this city park.